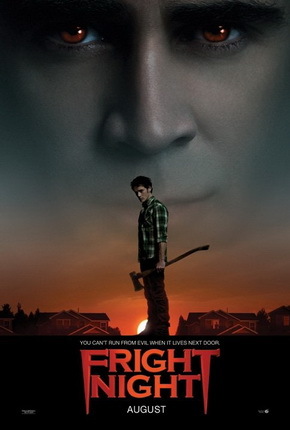 Ascending Butterfly: Are you ready for Fright Night 3D? One of my guilty pleasures since childhood has been horror movies. I got into major trouble trying to watch The Excorcist when it first came on TV. My mom forbid me to see it (not just in the theaters, but when it came on TV too as I was way too young), and the night it came on she stayed up to watch it and I snuck into the hallway where I could see the TV and tried to watch it from my sneaky vantage point, but got caught during a commercial when mom went for a bathroom break! It's my favorite movie genre and as a result, I'm probably a bit more critical than most about horror movies. That coupled with my fascination for all things Vampire makes me the worst girl ever to take to a horror movie. I am never going to be that girl. You know, the one who gets all scared at the horror movie so her date could be all protective and wrap his arms around her. I was never that girl and I'm still not! Last night I attended a late night special 3D screening of Fright Night, and here I am at a pretty ungodly hour still awake because I still can't resist horror movies! I remember seeing the first Fright Night in theaters when I was in High School, and seeing Fright Night 3D last night, made me feel like a teenager again! Not because they are similar, in actuality they are and they aren't, but somehow I just felt transported and started remembering the original Fright Night, and other horror movies that I watched back in my High School Days like The Lost Boys, Nightmare on Elm Street (part I, the rest just don't count, and yes I have seen them all), and thought back on my high school bedroom, while friends had posters of the Teen Beat hotties of the week, mine was primarily horror movie posters! The original Fright Night released in 1985, starring Chris Sarandon as sinister next door neighbor, Jerry Dandrige, turned out to be a surprise hit at the box office, making $6,118,543 on opening weekend. It was also the second highest-grossing horror film of 1985, bested only (surprisingly enough) by A Nightmare on Elm Street 2: Freddy's Revenge. In this remake of the 1985 original, teenager Charley Brewster (played by Anton Yelchin, who if you are a cable tv series fan, might remember him as 'Bird' on the show 'Huff') guesses that his new neighbor Jerry Dandrige (played by Colin Farrell) is a vampire responsible for a string of recent deaths. When no one he knows believes him, he enlists Peter Vincent (played by David Tennant, he is awesome, a total scene stealer, the role was played by Roddy McDowal in the original), a self proclaimed vampire killer and Las Vegas magician, to help him take down Jerry. (3) I decided I wanted to hate whoever was playing Roddy McDowal's role in this remake, and I couldn't! David Tennant is so good in the role, I found myself rooting for him despite myself! (4) Vegas was an interesting backdrop to the action this time around, I didn't see that coming. Is this one going to do as well as the original? That remains to be seen. It did sometimes rely a bit on the 3D. Sorry for the corny line but sometimes the 3D was used as an emphasis point, to make something 'pop' out at you. (yes I warned you it would be corny, but there was no other way to say it). Anton Yelchin did a great job bringing that certain innocence of youth to the role, which is not easy to do, especially for a version being geared to the youth of today. And David Tennant as Peter Vincent was absolutely well cast. 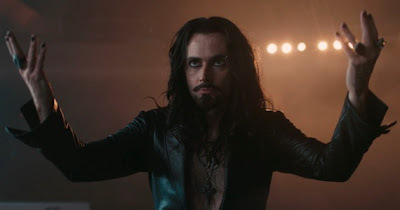 When he first appears on the screen my original thought was 'oh no, is he spoofing Criss Angel?' then I thought 'he's no Roddy' but he turned me around really quickly, he really did do a great job in this role, and him and Sandra Vergara (yes, Sofia Vergara's sister) who plays his girlfriend 'Ginger' are both real scene stealers in the movie. They provide the right comic relief and levity. Colin Farrell however is another story, he provided comic relief, but I'm not sure that he was always supposed to be doing so. He turned out to be my unpleasant surprise of the movie, his performance is a bit one dimensional, so I'm thinking it's a good thing there was some 3D. I'm not a big Twilight film lover but to date I honestly thought Robert Pattinson was the worst ever film vampire, but now I'm thinking it's Colin Farrell (he's definitely a fail as a Vamp and no flames here Twilight lovers, Vampires should not have 'twinkling' skin!!!). I'm also not a huge Toni Collette fan, so I wasn't super thrilled to see her cast as the mom, but she's 'dealable'. After seeing this movie, I'm still not convinced that the original really needed to be re-made, but in all fairness, it really wasn't AS bad as I thought, or as bad as some of the early reviews made it seem. If you are a die-hard fan of the original Fright Night, you may not be thrilled with the re-make, but if you go into it with an open mind, you can get some good laughs. And if you never saw the original and are just taking this one at face value, you'll probably enjoy it! So Butterflies, Are you ready for Fright Night 3D? I didn't know you were such a horror movie fan! Me I am THAT girl! I get so scared by the commercials for these movies. There is one that is freaking me out right now (its definitely not this movie). You should check out this new show (whose commercials also scare me) called Real Life Horror Stories or something like that. I don't think I am ready ~ looks much too gruesome for me. I am so sensitive!